Join us as a volunteer teaching English in Thailand, and help disadvantaged students improve their conversation through fun activities. 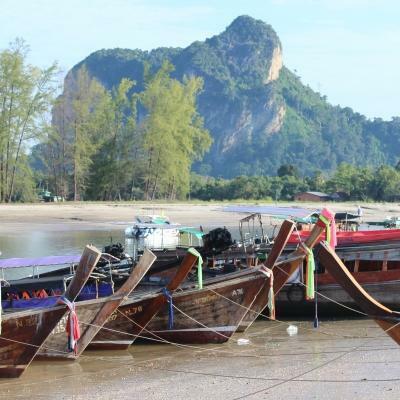 You’ll work in primary and secondary schools, based in the beautiful town of Krabi. This is a great way to add practical classroom experience to your CV, which can help your future career. There are a number of obstacles for Thai schools when it comes to providing students with quality English lessons. One particular challenge is that students don’t have many opportunities to practise and therefore lack the confidence to speak English. As a volunteer, you can support teachers during lessons and boost students’ confidence levels. You’ll also attend regular teaching workshops and, when possible, help with art, drama, music, and sports lessons. 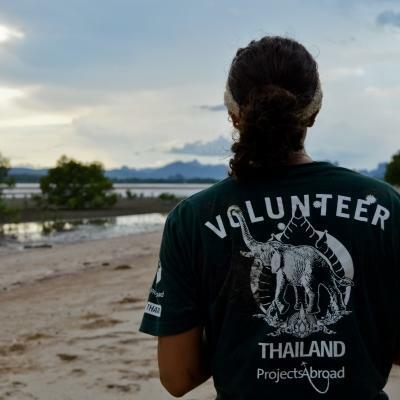 You’ll live and work in Krabi, and stay with a local host family or in shared bungalows with other volunteers. We encourage you to make the most of your stay, and explore stunning beaches and temples over weekends. We offer discounts for families and groups of friends travelling together. Call us on 01273 007 230 for more info. When you apply you only pay £195, which comes off the total price. Looking to do more than one project? Call us on 01273 007 230 to see if we can offer a discount. Is Teaching in Thailand right for me? 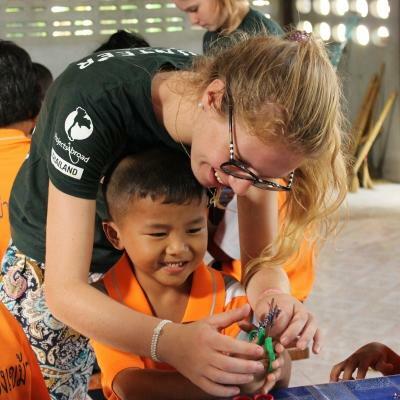 Volunteer teaching in Thailand is perfect for anyone who loves working with children, and wants to gain practical classroom experience. 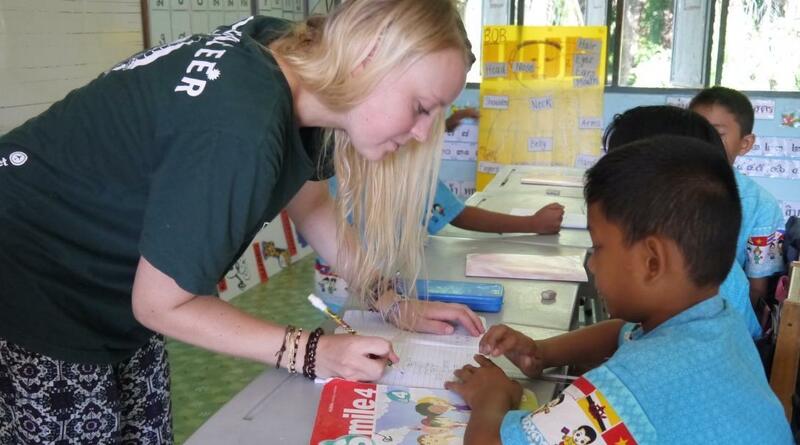 Getting teaching work experience in Thailand is especially useful if you’re planning on becoming a teacher. It will add value to your CV, and give you interesting points to talk about in applications and interviews. Even if you don’t work as a teacher, you’ll learn personal skills like planning that can be applied to any career. No experience? No problem! You will have a full induction on your arrival in Thailand, and we have regular workshops to help you. During the workshops, you can discuss lesson plans and challenges and exchange ideas. Projects Abroad staff are also there to support you and give advice whenever you need it. This project runs throughout the year, and you can join at any time from a minimum of one week. The longer you teach in Thailand, the greater an impact you can have on your students. What will I do on the Teaching Project? 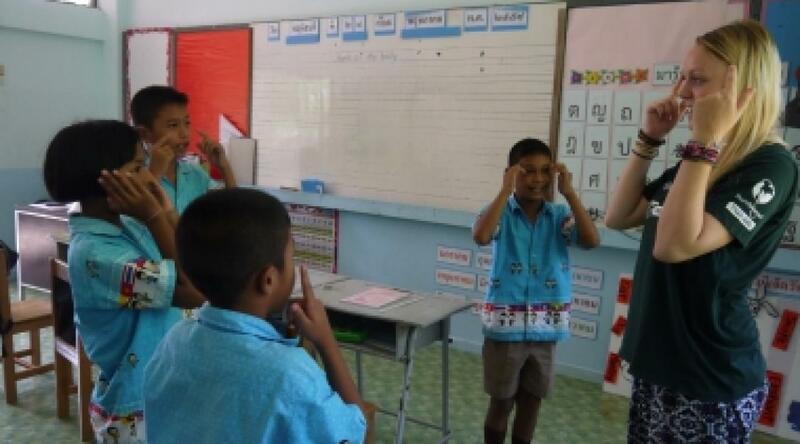 Your main role as an volunteer teaching in Thailand is to boost your students’ confidence levels when communicating in English. With well thought out lesson plans, you can deliver fun, engaging, and educational lessons. You can do things like create role plays using characters your students can relate to, or play a round of speaking Bingo! You will develop professionally from observing, assisting, and eventually leading your own activities or lessons in Thailand. We encourage you to spend time planning your classes, and reach out to teachers for advice and support. Each month on every second Thursday, time is set aside for a workshop and meeting in the afternoon. You can use this time to talk to other volunteers and Projects Abroad staff about your time at your placement, discuss problems, and share activities that have worked for you. Depending on your placement and your interests, you may be asked to assist with or lead extracurricular lessons. In the past, some volunteers have run an English club, or helped with soccer lessons. Chat with your Volunteer Advisor before your departure to Thailand, and we can match you to the school that would be the best fit for you. You can help teach English during school holidays for regular school placements. During this time, we organise a variety of holiday programmes including basic English lessons and fun educational activities in Krabi. We also arrange adult English classes in the local community. You’ll have more independence in these sessions, so you’ll need to plan ahead. Where will I be working in Thailand? You will work in public primary and secondary schools based in Krabi. Some school placements have basic resources like chalk boards instead of an interactive smart board. This will require you to think out of the box with how you lesson plan and teach. Krabi is a small town, with an approximate population of 400,000. Besides seeing locals, you’ll come across many tourists. Take advantage of your free time to explore attractions like the Buddhist Tiger Cave Temple. This unique temple is famous for its 1,237 stairs, which lead to a golden Buddha statue on the mountain summit. 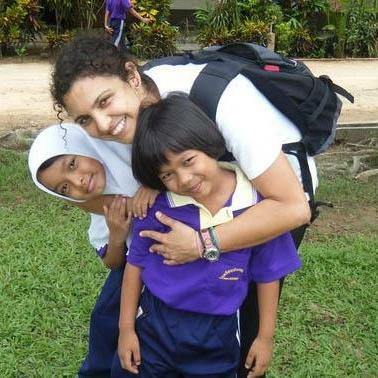 As a volunteer teaching English in Thailand, you will live with a friendly host family or in shared bungalows. You’ll have a modest and comfortable room, with basic amenities. When you arrive at your respective airport, a member of Projects Abroad staff will be there to meet you. You can find more detailed information on arrival airports, orientation, and visas on our Thailand Arrival Procedures page. Your day will begin with breakfast in your host family home. All teaching volunteers will be collected by transport organised by Projects Abroad, either from your host family home or from a prearranged spot. 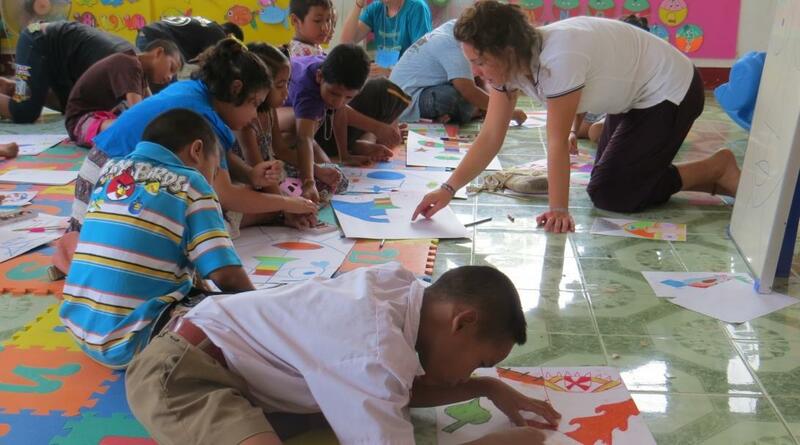 As a volunteer teaching English in Thailand, a typical day will begin around 8.30am and end at 1pm, Monday to Friday. This may differ depending on your placement. Teachers in Thailand dress smartly and you are expected to do the same. For female teachers, pack skirts that reach past your knees, trousers that cover the ankle, and make sure to wear shirts with a collar, or that cover your chest and shoulders. For males, shorts are not allowed, but trousers that reach your ankles are suitable. Wear shirts with a collar. For both male and female, closed, smart shoes are a must. On arrival at your placement, you can join the morning ceremony with the national anthem and morning prayer, or plan for the day ahead. You’ll begin as a teaching assistant and as you gain confidence in the classroom, you’ll take the lead on activities, or on a full lesson. During lunch, you’ll eat a packed meal from home. You may be asked to organise some sport or music activity during the lunch break. Depending on your placement, you’ll teach lessons in the afternoon, or lesson plan for the following day. At your placement, you’ll have a teaching supervisor who you can ask for help or get ideas from. Your transport will collect you at the end of your day. Free time in the evenings, or weekends can be used to travel around Krabi, or Thailand! Eat your weight in delicious Pad Thai, sip beverages on Ao Nang’s beautiful beaches, relax in your host family home, or meet up with volunteers to catch up. The aim of this project is to help students improve their conversational English. This gives students a better chance of securing good jobs in the future, and a chance to create global networks with visitors to Thailand. There are many obstacles in English language teaching and learning in Thailand, such as inadequately equipped classrooms and a lack of educational resources. Students often lack the confidence to speak English with their teacher and classmates. They also don’t have many opportunities to practice speaking in their daily lives. You can offer invaluable help in improving not only the student’s, but also the teachers’ phonetics, pronunciation and grammar. Help us achieve these goals by volunteering to teach English in Thailand. "Having had such an amazing teaching experience, I have now realised how fun and rewarding this type of job gave me. I have decided to change my career and become a trainer in Engineering so now I can focus on helping, teaching and influencing people whilst also making a difference in my students’ lives!" You'll stay with a host family in Krabi. They will welcome you into their home, eager to share their customs and have you teach them about your own culture. We believe that this is the best way to immerse yourself in the culture of Thailand and have a truly unique experience. Experience the stunning landscapes and rich cultures of Southeast Asia. Thailand is an unforgettable country with plenty of enticing things for you to get up to in your free time. One of the highlights of volunteering in Thailand is the pristine beaches. With stunning snorkelling and scuba diving opportunities, it’s a great destination to choose if you’re interested in marine life. For others, there’s always the chance to relax on the beach in the warm glow of the sun. One must-see while you’re there is the Tiger Cave Temple. With its rich history and ornate statues, it’s an experience not to miss. Be prepared for a steep walk up 1,237 steps! But once you get to the top, the views make it all worth it. Exploring the Khao Phanom Bencha National Park, with its mysterious caves and sparkling waterfalls, is the perfect way to spend a Saturday or Sunday. 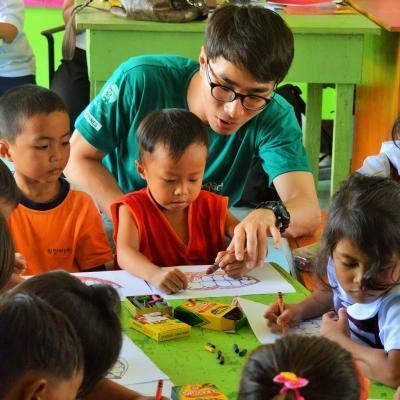 We run many different projects in Thailand, so there will likely be other volunteers relishing in this experience with you. You can choose to travel alone or with other volunteers. This placement is fully researched, safety audited, and risk assessed in accordance with the British Standard BS8848 for the Adventure Travel Sector. Ant started working as the Director of our teaching and care projects in July 2007 after moving to Krabi from Chang Mai. She used to work in the shipping business. She took over as Thailand Country Director in November 2012. She enjoys working with people from all over the world and in her free time likes travel, photography and spending time with her boyfriend. Apornpradab, or Nou, as she is known, originally worked for Projects Abroad in Thailand from March 2007 to July 2009, when she left to have a baby. Now that Nou's daughter, Mali is getting older, she has rejoined the staff team from December 2011. Nou enjoys cooking. Andrea was born in Italy and lived in Abu Dhabi during his childhood. He studied Environmental Biology and Marine Ecosystems at the University of Trieste. After obtaining his Master's degree, he started travelling and working in countries such as Brazil, Greece and the Maldives. He first experienced volunteering at an NGO in Cambodia, which got him involved in marine biology field work. He also loves to dive and has obtained his dive instructor certificate. Montira joined the Projects Abroad Thailand team in September 2014. Having a Dutch father and a Thai mother, allowed her the privilege of experiencing both cultures while growing up. 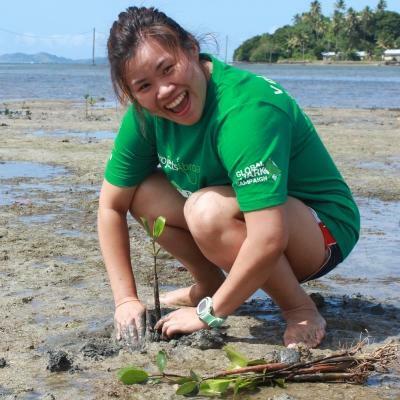 For 8 years she worked as a sales and marketing manager in Brussels, before she joined several Marine Conservation projects in Fiji, Iceland and Vietnam. She is a PADI divemaster and has love for anthropology and conservation. Montira is currently responsible for the Environmental & Climate Change project. ‘Vi’ has been part of the Projects Abroad team for three years. He was born in Japan, but is of Indian decent and completed his Bachelor’s degree in Australia. Vi is passionate about wildlife and loves the outdoors. He also enjoys playing soccer with his friends.